Two platinum mounted emerald cut and brilliant cut diamond set rings. Made in Chichester, England. Some beautifully executed hand engraving on this ring by one of our diamond setters. Yellow pear shaped diamond cluster, mounted in platinum. Made in Chichester, England. A full eternity ring, U-claw set with brilliant cut diamonds graduating in size. Big stones around the back can be uncomfortable but no-one minds them at the front! Made in Chichester, England. 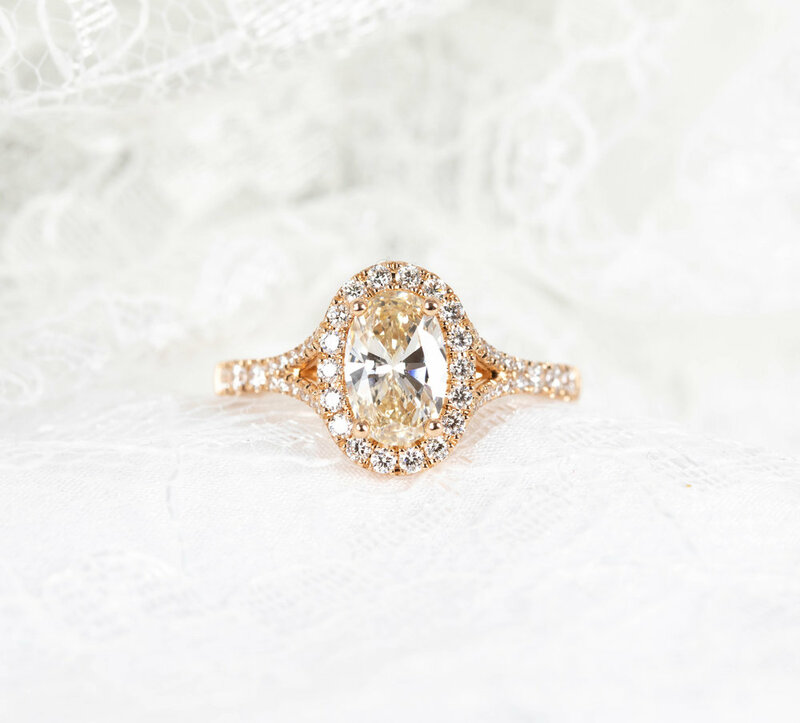 Platinum and rose gold mounted cushion cut and brilliant cut diamond cluster ring. Made in Chichester, England. Five stone claw set platinum ring. Made in Chichester, England. Platinum mounted classic emerald cut diamond solitaire. made in Chichester, England. Platinum mounted double halo cluster ring. Made in Chichester, England. Fabulous three stone emerald cut diamond ring with tapered baguette shoulders. Rub-over set in precision made platinum mount. Made in Chichester, England. 18ct yellow gold mounted three stone emerald cut diamond ring with grain set shoulders. Made in Chichester, England. Platinum mounted pear shaped diamond, rub-over set twist ring. Made in Chichester, England. Classic modern three stone diamond ring. Made in Chichester, England. Matching emerald cut diamond cluster and diamond set band. Made in Chichester, England. Platinum mounted Art Deco style cluster ring. Remounted form customers own stones with a few additions. Made in Chichester, England. Platinum mounted 1920's style ring. New mount made to replace the worn out original ring.. Made in Chichester, England. 18ct rose gold and platinum multiband ring. Made in Chichester, England. Platinum mounted 3 row diamond band. Made in Chichester, England. 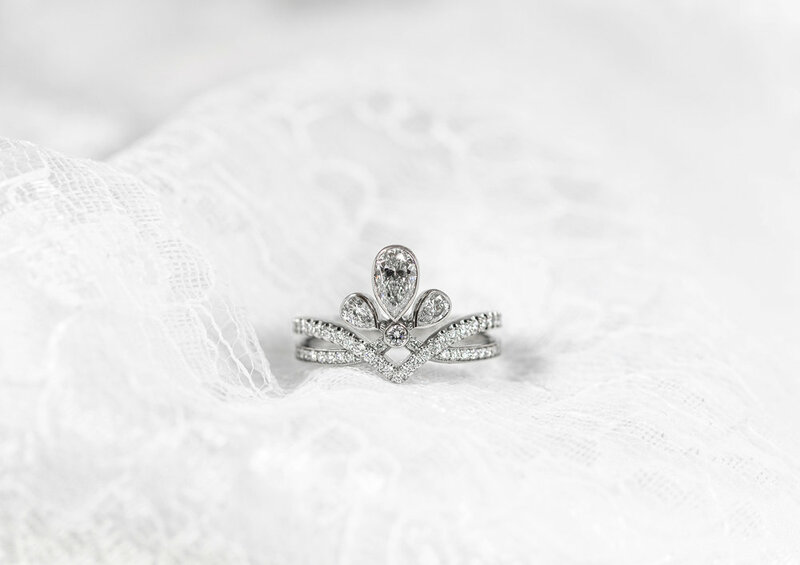 Art Deco style diamond cluster ring. Made in Chichester, England. Graduating seven stone emerald cut diamond half hoop ring in U-shaped collet mount. Made in Chichester, England. 1920's style oval diamond set triple cluster platinum ring. Made in Chichester, England. Platinum mounted 5ct total baguette cut diamond eternity ring. Made in Chichester, England. Platinum mounted modern style diamond three stone ring with grain set diamond set shoulders. Made in Chichester, England. Platinum mounted half eternity ring with cut away setting. Classic 3 stone ring with eternity ring and wedding band. Cushion cut diamond with grain set diamond surround and shoulders finished with millegrain edge decoration. Made in Chichester, England. Stunning marquise diamond set halo cluster ring with diamond set split shoulders. Made in Chichester, England. Asscher cut octagonal 1920's style cluster. Made in Chichester, England. Channel set diamond full eternity ring. Made in Chichester, England. Emerald and princess cut diamond 3 stone ring with cut away set diamond shoulders. Made in Chichester, England. Emerald, baguette and round cut diamond cluster in Art Deco style mount. Made in Chichester, England. Three pretty round diamond cluster rings. Made in Chichester, England. Round halo diamond cluster ring with matching eternity ring. Made in Chichester, England. Cushion brilliant cut diamond solitaire ring. Made in Chichester, England. Modern style rub-over and grain set round cluster ring with matching diamond set band. Made in Chichester, England. Classic 4 claw set half carat solitaire matched up with simple court shaped band and cut away set diamond eternity ring. Made in Chichester, England. Four claw set 0.37ct diamond solitaire with cut away set shoulders and matching band. Made in Chichester, England. Modern 3 stone diamond ring with channel set diamond shoulders. Made in Chichester, England. New cluster mount for customers emerald cut diamond with matching diamond band. Made in Chichester, England. 4ct brilliant cut diamond solitaire ring. Made in Chichester, England. Rub-over set emerald cut diamond with graduated grain set diamond shoulders. Made in Chichester, England. Bespoke mount made for customers own diamond with matching diamond set band. Made in Chichester, England. Traditional coronet style diamond cluster. Made in Chichester, England. New mounts made for customers stones. Made in Chichester, England. Pretty early C20th style diamond cluster ring made for customers centre stone. Made in Chichester, England. New mount made for customers centre cushion cut diamond. Made in Chichester, England. Platinum mounted princess cut centre and grain set diamond surround. Made in Chichester, England. Matching set of wedding rings made with customers old cut diamonds. Grain set with millegrain edge decoration. Made in Chichester, England. A platinum mounted spiral multiband ring rub-over set with a customers own diamonds. Made in Chichester, England. Platinum mounted oval diamond set ring with diamond set shoulders. Made in Chichester, England. Platinum mounted 0.70ct cushion cut and round brilliant cut diamond 3 stone ring with grain set diamond shoulders. Made in Chichester, England.